It is the start of the season of celebrating and feasting. We can all be thankful that we live in a climate that allows us to participate in boating activities all year long. Come out and enjoy your reward for enduring the heat of July and August. then relish a holiday dessert and drinks contest in the Waterford Harbor Marina ice house. Prizes for the best decorated boats and best holiday treats. 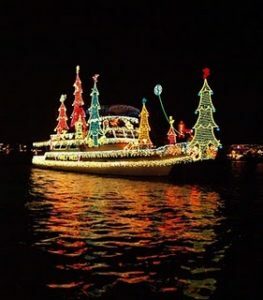 Many members decorate their boats for participation in the Kemah Christmas Boat Parade, and some just decorate their boats because ’tis the season. Afterwards we’ll meet at Pavilion B (or the ice house in the event the weather actually turns cold) for the dessert and drink contest. On a cold Saturday night, the Waterford Ice House filled with the scent of peppers and the sound of a jovial crowd. The large crowd had a difficult job to perform, selecting winners from the large number of worthy entries. Winners were crowned in 3 divisions: Chili with Beans, Chili without Beans, and Chili with Alternative Ingredients. Gary and Tonie Hanson, once again, did an excellent job of hosting and MCing the night. The lucky winner in each division was presented with a gift certificate to Grazia Italian Kitchen and a colorful soup ladle to inspire them for next year. The weather cooperated by turning cool and the WYC group certainly enjoyed the annual competition.